You, Me and Movies: Are there any positive aspects regarding the 2017 summer box office slump? Are there any positive aspects regarding the 2017 summer box office slump? I've been reading a lot on the internet about the movie business. I have been all of my life, and within the last few weeks, everybody keeps talking about the big box office slump we are in. I have been reading that the box office is down 8% in revenue this summer. There are several writers who are already writing obituaries for the Hollywood industry. But the thing is, the movie business is truly not going anywhere. Lots of people are merely comparing the box office records to those of last year, which was a record-breaking year. Just like with any business, there are highs and lows, and 2017 is featuring a slower summer. That isn't good for the studios, because the summer is the season that turns studios into money machines. Or at least, that's the plan each year. It doesn't always work, but to compare a record breaking year to a year that is only half way done seems a little unfair. Why is the box office down 8%? Well, its honestly hard to say. I am no expert on box office figures and I have never paid much attention to it. I don't think a good film can be measured by how much money it makes, which is why box office numbers are figures I have never discussed on this blog. I like or dislike movies based upon how they make me feel. I could care less how much money they make. I don't think it has to do with streaming services. Between Hulu, Netflix and Amazon, we have not seen any streaming service really breakout yet with a cinematic hit. Netflix kills it with their original television shows. But while I personally love "Beasts of No Nation" and "Okja," there original films have seen far less hits. Nobody really talks about them. Perhaps one day these streaming services could break out with some great films, but it has yet to be determined. I can only guess that people are starting to suffer from franchise fatigue. It seems like moviegoers of all types are finally ready for some originality, and we are not getting it. Its easy to see, I have been pretty critical of the movie business recently, simply because everybody is doing the same thing. Every studio wants a brand that they can turn into the next big movie franchise, it has to be based off of something, because if that's the case, there is already an internal fan base. Then a studio can plan sequels, prequels, spin-offs and be set for a decade. The problem is that studios will set a release date; before a script is in place, before production has started, before half the cast has been picked. Usually there is a "writing room" so that five or so writers can work on one script. The entire making of the movie is generally rushed in order to make the date, depending on how much time the studio grants the filmmakers, which varies. The best case scenario gets you the Marvel Cinematic Universe, the worst case scenario gives you "Batman vs. Superman" or more recently, "The Mummy." Certainly not every major studio release is a major tentpole release, but movie theaters across the nation are littered with sequels, prequels, homages, and adaptations, and there is little to no risk in the business anymore. Like I wrote a few weeks back, its starting to cause problems in the business. Audiences are beginning to see that everything feels the same when they go to the theater, so they feel the need to save their money on other stuff. People seem to be taking word-of-mouth in a more literal manner. Also, for the first time in forever, critics and audiences are starting to see movies eye-and-eye. That rarely happens. It seems the audiences are agreeing with the "tomato meter" much more often than they did, even, say, last year. It seems critics and audiences alike are starting to want more from their films than just more of the same. The thing is, will studios see what is happening this summer, take it to heart, and try to improve their offerings next year? Its hard to say, because even though the box office took a hit this summer, the season isn't over. Who knows what kind of business "War of the Planet of the Apes," "Dunkirk," "Valerian and the City of a Thousand Planets," "Atomic Blonde," "The Emoji Movie," or "Annabelle: Creation" will bring in. 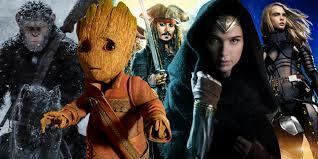 There have already been some substantial hits this summer, "Wonder Woman," "Guardians of the Galaxy, Vol. 2," "Spider-Man: Homecoming," "Baby Driver," and yes, "Pirates of the Caribbean" and "Transformers 5" have all made decent money this year. While many of those are sequels, it should be noted that "Baby Driver," is an original idea that is taking movie theaters by storm. Another movie with the same traction is "The Big Sick," which I will be seeing and reviewing this Saturday. In a summer season this competitive, its tough for the independent films to stick out, but both "Baby Driver" and "The Big Sick" have been shining through, making names for themselves. All proof that audiences are pumped and primed for new ideas. The rub is, the studios will only see the revenue earned, and continue down the same path. Even though there is a box office slump. The box office goes up and down every few years, so will that mean anything changes at all? I can only hope that the studios will pull the reins on all their big franchises and say, what can we do differently to attract the audiences? I hope that is what they do. I am an optimist when it comes to the movie business. At least at heart I am. My brain is a realist towards Hollywood, and its always tough getting your heart and your head together sometimes. I don't know what the future will bring, I just hope something positive comes from the box office numbers of summer 2017.